The Notched Noise option R&S®SMW-K811 provides the possibility of Noise Power Ratio (NPR) measurements with internal or external created waveforms. 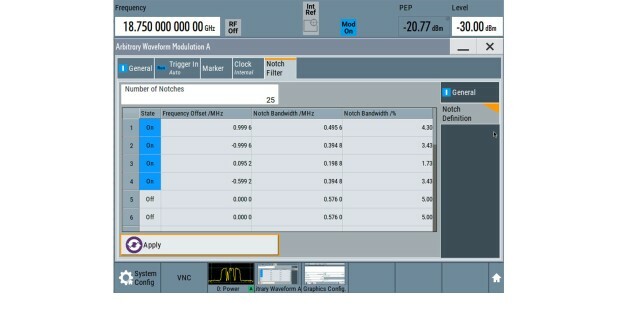 The NPR measurement enables the user to evaluate the linearity of wideband-amplifiers in a simple manner. The Notched Noise functionality allows to define up to 25 notches. For every notch, frequency offset and bandwidth can be set individually.